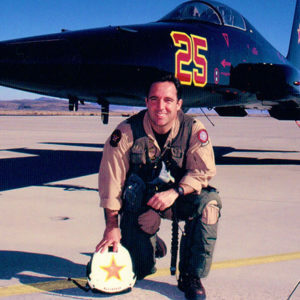 Jim “Guido” DiMatteo, piloted fighter jets for more than twenty-five years in the US Navy. Logging over than 5,000 hours flying the F-14, F/A-18, A-4, F-5N and F-16N (the only pilot ever to do so), he was eventually tapped by TOPGUN, and was the first in history to command the adversary squadrons (VFC-13 Saints, VFC-111 Sundowners) on both coasts. It was there that he accumulated more flight time than anyone in the history of the US Navy and Marine Corps and has been awarded numerous accolades, including US Navy Fighter Pilot of the Year and US Navy Adversary Pilot of the Year. Before he retired in 2013 as a Captain, he concluded his military career at CNAF (Commander, Naval Air Forces, which is the headquarters of Naval Aviation) in Coronado, California. In 2007 he was recruited to be the first and only US Race Director for the International Red Bull Air Races, the first person from the United States ever to hold the role for what has become the official World Championship. DiMatteo was responsible for the development and coordination of all US aviation related activity, Rules and Regulations development, FAA (or international equivalent) liaison, execution and oversight of all flying sessions and was critical in the race track design, which is unique to each worldwide location. In 2012, Jim was asked to revamp AirVenture, and he assumed responsibility for all Flight Ops as well as Features & Attractions. The three years that Jim led the air show are known to be among the best, and safest, in the 64 year history of the event. In 2014, he departed Oshkosh to run Breitling Aviation in the US. As the Director of the Breitling Jet Team American Tour, he led the first tour in U.S. history where an International Jet Team flew so extensively in the US, performing in more than 40 air shows and over 100 displays and media flights. DiMatteo has been awarded an unprecedented number of individual aviation and squadron command awards, including Fighter Pilot of the Year, Adversary Pilot of the Year, TOP HOOK (top pilot landing on the aircraft carrier), and the esteemed Britannia Award from the United Kingdom for Top Strike-Fighter Pilot of the Year. Jim currently resides in Coronado, California with his wife Kathy and their two children. © 2019 NWOC. All Rights Reserved.